Amsterdam, 13 April 2018. Fastned, a company that is rolling out a network of fast charging stations throughout Europe, has won a tender from the North East Combined Authority (NECA) and Newcastle University to realise two fast charging stations in the city centres of Newcastle and Sunderland. The “Go Ultra Low Filling Stations” will draw on Fastned’s experience of building iconic stations that allow multiple electric vehicles (EVs) of any make and model to charge as fast as they possibly can. Each station will house six fast chargers (known as “rapid” chargers in the UK), with two of those at the Newcastle University site being the latest 175kW (and 350kW enabled) chargers. These high powered chargers are capable of charging EVs up to 100 times faster than at home. Drivers of many of the new EV models that will be released from 2018 onwards will now be able to add 125 miles of range to their cars in under ten minutes, while being sheltered by Fastned’s recognisable solar photovoltaic canopies. Meanwhile, all EVs already on the road will still be able to visit the stations to top up their batteries at their maximum charge rate. As part of the agreement, Fastned will be collaborating closely with Newcastle University’s researchers to develop a greater understanding of the impact of EV charging on local electrical grids, and the potential roles for EVs and battery storage in the smart electrical grids of the future. At the same time, Fastned will work with NECA to research and understand business models for electric vehicle infrastructure in the region. The Newcastle station will be located within the Newcastle University’s Newcastle Helix site, while the Sunderland station will be located near the heart of the city responsible for manufacturing the world’s most successful EV: the Nissan Leaf. The project is co-funded by the European Regional Development Fund (ERDF), the UK Collaboratorium for Research in Infrastructure and Cities (UKCRIC), and the UK Government’s Office for Low Emission Vehicles (OLEV). Fastned will manage the stations’ design and construction, and operate and maintain them as part of its growing network. Fastned aims to build many more multi-charger stations all around the UK over the next three years, giving freedom and flexibility to EV drivers, and helping to usher in a revolution in decarbonised transport. In 2017 Fastned also won a tender with Transport for London (TfL) to build and operate fast charging locations in the Greater London area. TfL is currently in the process of developing sites and making them available for Fastned and four other selected parties to bid for. 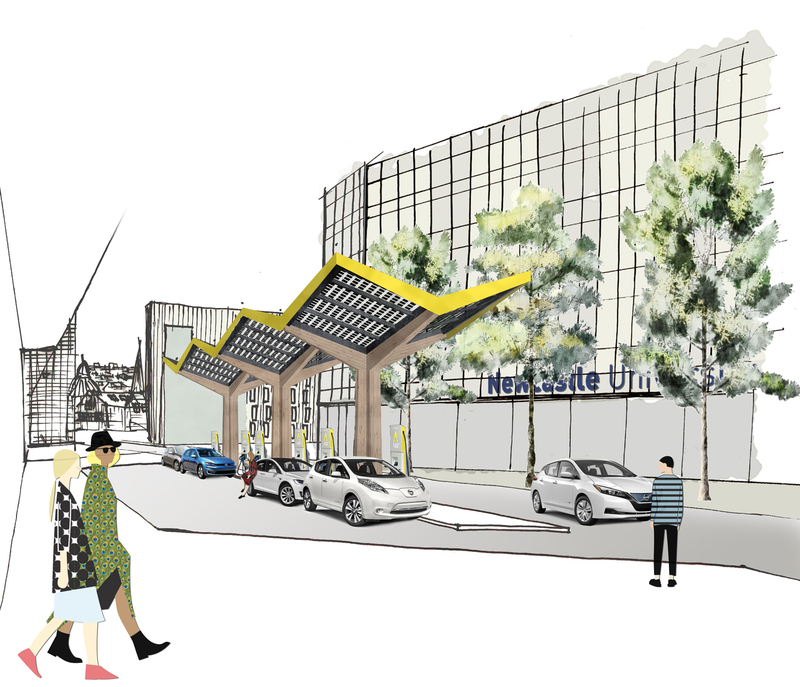 Below you can download the visual of the Fastned station at the Newcastle University’s Newcastle Helix site. For images of existing Fastned stations, go to our presskit.